This article is about the American football cornerback. For the offensive lineman, see Kyle Fuller (offensive lineman). For other uses, see Kyle Fuller (disambiguation). A native of Baltimore, Maryland, Fuller attended Mount Saint Joseph High School. He recorded one interception his senior year, and played in the Maryland Crab Bowl, an all-star game, despite missing most of his season with a finger injury. He had four interceptions as a junior, returning two of those for touchdowns. He also had a punt return touchdown and kick return score that season. Fuller was also on the school's track & field team, where he competed as a sprinter and jumper. He won the long jump at the 2010 Woodlawn Warrior Invitational, with a personal-best mark of 6.41 meters. At the 2010 IAAM-MIAA Champs, he took fifth in the 300-meter dash, clocking at 37.98 seconds. Considered a three-star recruit by ESPN.com, Fuller was listed as the No. 43 cornerback in the nation in 2010. Fuller during his tenure at Virginia Tech. 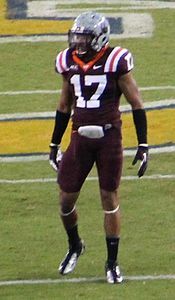 Fuller started seven games in 2010 as a true freshman, primarily in the Hokies’ nickel defense. He recorded 32 tackles, four for a loss, broke up six passes and forced a fumble. In 2011, as a second-team All-ACC selection at corner, he started all 14 games at two different positions. He started at nickelback/whip linebacker for seven games and corner for the other seven games. He played over 1000 snaps on defense and 100 on special teams. He recorded 65 tackles, a team-high 14.5 tackles for loss and 4.5 sacks on the season. He also added seven pass breakups, two interceptions, five quarterback hurries, a forced fumble and a fumble recovery. In 2012, as honorable mention All-ACC at corner, he started all 13 games and recorded 52 tackles, including three for loss, two interceptions and five pass breakups. In 2013, he was one of the Hokies’ four permanent captains. He was named a third-team All-ACC selection, and played in nine games, making eight starts and missing the team's final four games due to injury. He recorded 24 tackles, two interceptions and 10 pass breakups in his final season. Fuller attended the NFL Scouting Combine and performed all of the combine drills. On March 19, 2014, Fuller participated at Virginia Tech's pro day, but opted to stand on his combine numbers and only performed positional drills. He was projected to be a first round pick by NFL draft experts and scouts. Fuller was ranked as the top cornerback prospect in the draft by NFL draft analyst Mike Mayock, was ranked the third best cornerback by DraftScout.com, and was ranked the sixth best cornerback by Sports Illustrated. The Chicago Bears selected Fuller in the first round (14th overall) of the 2014 NFL Draft. He was the second cornerback selected in the draft, behind Justin Gilbert (eighth overall, Browns). On May 14, 2014, the Chicago Bears signed him to a four-year, $9.68 million contract with a signing bonus of $5.36 million. Head coach Marc Trestman named Fuller the third cornerback on the Bears' depth chart to start the regular season, behind Tim Jennings and Charles Tillman. He made his professional regular season debut in the Chicago Bears' season-opener against the Buffalo Bills and recorded five combined tackles in their 23–20 loss. On September 14, 2014, Fuller made a season-high seven combined tackles, two pass deflections, and two interceptions during a 28–20 victory at the San Francisco 49ers on Sunday Night Football. He made his first career interception off a pass by quarterback Colin Kaepernick, that was intended for wide receiver Michael Crabtree, and returned it for a 20-yard gain in the fourth quarter. He became the first Bears' rookie to record two picks in a game since Chris Harris in 2005. He was named the NFC Defensive Player of the Week and became the first Bears' rookie defensive back to receive the award since Mark Carrier in 1990. In Week 3, Fuller earned his first career start after Charles Tillman sustained a triceps injury and was placed on injured reserve. He recorded seven combined tackles, two pass deflections, forced two fumbles, and made an interception as the Bears defeated the New York Jets 27–19 on Monday Night Football. He became the first NFL player in 20 years to record three interceptions and two forced fumbles in their first three games. In Week 13, he collected a season-high seven solo tackles and broke up a pass during a 34–17 loss at the Detroit Lions. On December 29, 2014, the Chicago Bears fired head coach Marc Trestman after they finished with a 5–11 record in 2014. He finished his rookie season in 2014 with 64 combined tackles (51 solo), ten pass deflections, four interceptions, and three forced fumbles in 16 games and 14 starts. Fuller entered training camp slated as a starting cornerback. Head coach John Fox officially named Fuller a starting cornerback to start the regular season, opposite Tracy Porter. On October 18, 2015, Fuller collected a season-high eight combined tackles during a 37–34 loss at the Detroit Lions. In Week 8, he made two combined tackles, a season-high two pass deflections, and intercepted a pass by quarterback Teddy Bridgewater in the Bears' 23–20 loss to the Minnesota Vikings. He started all 16 games and recorded 55 combined tackles (47 solo), nine pass deflections, and two interceptions. Fuller struggled through the early portion of the season, which included being responsible for two major defensive pass interference penalties, raising the possibility of being moved to safety. He eventually improved as the year progressed. Throughout training camp, Fuller dealt with a knee injury. On August 18, 2016, he underwent arthroscopic knee surgery to repair his knee injury. On September 28, 2016, the Chicago Bears placed Fuller on injured reserve after being inactive for the first three games while recovering from knee surgery. On November 30, 2016, Fuller returned to practice, but was not added to the active roster and remained on injured reserve for the entire 2016 season. On April 29, 2017, Chicago Bears' general manager Ryan Pace announced that the team would not pick up the fifth-year option on Fuller's rookie contract. Throughout training camp, he competed to be a starting cornerback against Marcus Cooper and Prince Amukamara. Head coach John Fox named Fuller the third cornerback on the depth chart to start the regular season, behind Cooper and Amukamara. Fuller started in the Chicago Bears' against the Atlanta Falcons after Prince Amukamara injured his ankle during the preseason and was inactive for the first two regular season games. Fuller recorded six combined tackles and broke up a pass in their 23–17 loss. In Week 5, he earned the start after Marcus Cooper was unable to play due to a back injury. Defensive coordinator Vic Fangio chose to retain Fuller as a starting cornerback for the rest of the season. On December 3, 2017, Fuller collected a season-high seven combined tackles, two pass deflections, and intercepted a pass by quarterback Jimmy Garoppolo during a 15–14 loss to the San Francisco 49ers in Week 13. He had a career year in 2017, starting all 16 games recording 69 combined tackles (61 solo), a career-high 22 pass deflections, and two interceptions. He earned an overall grade of 84.3, which ranked 21st among all qualified cornerbacks in 2017. On March 6, 2018, the Chicago Bears placed the transition tag on Fuller worth $12.971 million. On March 16, 2018, the Green Bay Packers extended a four-year, $56 million contract with $18 million guaranteed offer to Fuller, which the Bears then matched later that day, keeping Fuller under contract with the Bears through 2021. Fuller's 2018 season opened on a disappointing note when he dropped a potential game-sealing interception against the Packers, who eventually scored on the drive to win 24–23; after the game, he commented, "All I got to say is I got to catch it." In Weeks 6 and 7 against the Miami Dolphins and New England Patriots, he recorded three total interceptions, two off the former's Brock Osweiler and once off the latter's Tom Brady. The two picks in Miami marked the first time that a Bear recorded two interceptions in a game since Fuller's performance against the 49ers in 2014. During the remainder of the regular season, he recorded four more interceptions against Nathan Peterman of the Buffalo Bills, Matthew Stafford of the Detroit Lions, Eli Manning of the New York Giants, and Jared Goff of the Los Angeles Rams. Fuller finished the season with 55 tackles, 21 passes defended, and shared a league-leading seven interceptions with Xavien Howard and Damontae Kazee. He received an overall grade of 81.4 from Pro Football Focus in 2018, which ranked as the 7th highest grade among all qualifying corner backs. On December 18, Fuller was selected to his first Pro Bowl. He was later also named to first-team All-Pro along with teammates Khalil Mack, Eddie Jackson, and Tarik Cohen. Kyle's older brothers are former Hokies football players, as well. His eldest brother, Vincent, is a retired NFL safety who spent the majority of his career with the Tennessee Titans. His older brother, Corey, is a free agent wide receiver who previously played for the Detroit Lions and New Orleans Saints. Their younger brother, Kendall, is a cornerback for the Kansas City Chiefs. ^ "Kyle Fuller, DS No. 3 CB, Virginia Tech". DraftScout.com. Retrieved June 25, 2018. ^ Mike Mayock (May 5, 2014). "2014 NFL Draft: Mike Mayock's top 100 prospects". NFL.com. Retrieved June 25, 2018. ^ "Top 100 Prospects of the 2014 NFL Draft". si.com. May 1, 2014. Retrieved June 25, 2018. ^ "NFL Draft Profile: Kyle Fuller". NFL.com. Retrieved June 25, 2018. ^ Hanzus, Dan (May 14, 2014). "Chicago Bears, first-round pick Kyle Fuller strike deal". NFL.com. Retrieved August 17, 2014. ^ Wilson, Aaron (May 14, 2014). "Bears sign Kyle Fuller to $9.687 million rookie contract". BaltimoreSun.com. Retrieved June 25, 2018. ^ "Bears Official 2014 Depth Chart". 247Sports.com. Retrieved June 25, 2018. ^ "Bears-49ers Fast Facts". WBBM-TV. September 15, 2014. Retrieved September 17, 2014. ^ Campbell, Mark (September 17, 2014). "Fuller named NFC Defensive Player of the Week". Chicago Tribune. Retrieved September 17, 2014. ^ Gray, Jeff (September 15, 2014). "Charles Tillman out for year with triceps injury, per report". SBNation.com. Retrieved June 25, 2018. ^ "Jay Cutler puts Bears up early before Geno Smith-led rally falls short". ESPN. September 22, 2014. Retrieved September 22, 2014. ^ Mayer, Larry (September 23, 2014). "What we learned in win over Jets". Chicago Bears. Retrieved September 26, 2014. ^ "NFL Player stats: Kyle Fuller (2014)". NFL.com. Retrieved June 25, 2018. ^ Rosenthal, Gregg (December 29, 2014). "Chicago Bears fire Marc Trestman". NFL.com. Retrieved June 25, 2018. ^ a b c "NFL Player stats: Kyle Fuller (career)". NFL.com. Retrieved June 25, 2018. ^ Biggs, Brad (August 1, 2015). "Cornerback Tim Jennings warming up to role in Bears' nickel package". ChicagoTribune.com. Retrieved June 25, 2018. ^ "Ourlads.com: Chicago Bears Depth Chart: 09/01/2015". Ourlads.com. Retrieved June 25, 2018. ^ "NFL Player stats: Kyle Fuller (2015)". NFL.com. Retrieved June 25, 2018. ^ Medina, Luis C. (December 15, 2015). "Bears CB Kyle Fuller has been a top-10 cornerback since the bye". USA Today. Retrieved April 3, 2018. ^ Wierderer, Dan (August 18, 2016). "Bears cornerback Kyle Fuller out indefinitely after knee surgery". ChicagoTribune.com. Retrieved June 26, 2018. ^ Mayer, Larry (December 21, 2016). "Fuller reverts back to injured reserve". ChicagoBears.com. ^ Gantt, Darin (April 30, 2017). "Bears won't pick up the option on Kyle Fuller's contract". ProFootballTalk.NBCSports.com. ^ "Ourlads.com: Chicago Bears Depth Chart: 09/01/2017". Ourlads.com. Retrieved June 25, 2018. ^ Perez, Bryan (September 6, 2017). "Position-by-position look at the Bears' depth chart for Week 1 vs. Falcons". BearsWire.USAToday.com. Retrieved June 26, 2018. ^ Tyler Dragon. "Bears' CB Prince Amukamara suffers ankle injury on Sunday". all22.com. Retrieved October 24, 2017. ^ Cox, Lorin (October 9, 2017). "Bears CB Marcus Cooper inactive vs. Vikings with back injury". bearswire.usatoday.com. Retrieved June 26, 2018. ^ "NFL Player stats: Kyle Fuller (2017)". NFL.com. Retrieved June 26, 2018. ^ "Pro Football Focus: Kyle Fuller". ProFootballFocus.com. Retrieved June 26, 2018. ^ Sessler, Marc (March 6, 2018). "Chicago Bears place transition tag on Kyle Fuller". NFL.com. ^ Wesseling, Chris (March 16, 2018). "Bears match Packers' offer sheet for CB Kyle Fuller". NFL.com. ^ Eurich, Matt (September 10, 2018). "Kyle Fuller on missed interception: 'Just got to catch it'". 247Sports.com. Retrieved October 14, 2018. ^ Kane, Colleen (October 21, 2018). "A few big Bears mistakes, lack of a pass rush help Tom Brady come back comfortably". Chicago Tribune. Retrieved January 4, 2019. ^ Finley, Patrick (October 16, 2018). "Bears CB Kyle Fuller's two interceptions 'something we definitely needed'". Chicago Sun-Times. Retrieved January 4, 2019. ^ Eurich, Matt (November 4, 2018). "Kyle Fuller intercepts Bills QB Nathan Peterman". 247Sports.com. Retrieved January 4, 2019. ^ Eurich, Matt (November 22, 2018). "Kyle Fuller seals Bears victory with late interception". 247Sports.com. Retrieved January 4, 2019. ^ Cox, Lorin (December 2, 2018). "WATCH: Kyle Fuller baits Eli Manning for league-leading 6th interception". NBC Sports Chicago. Retrieved January 4, 2019. ^ Kane, Colleen (December 9, 2018). "4 interceptions, 1 safety and an offensive lineman TD: Bears top high-scoring Rams 15-6". Chicago Tribune. Retrieved January 4, 2019. ^ Kelly, Omar (January 4, 2019). "Dolphins cornerback Xavien Howard named a second-team All Pro". Sun-Sentinel. Retrieved January 4, 2019. Missing the final games prevented Howard from pushing for the NFL’s lead in interceptions. He finished the year tied for the lead with Chicago’s Kyle Fuller and Atlanta’s Damontae Kazee. ^ "Pro Football Focus: Kyle Fuller". profootballfocus.com. Retrieved March 31, 2019. ^ Barker, Jeff (November 15, 2013). "For Fuller brothers, Virginia Tech has become a family home". BaltimoreSun.com. Retrieved July 4, 2014. Wikimedia Commons has media related to Kyle Fuller. This page was last edited on 25 April 2019, at 14:18 (UTC).